Keep your older cat's claws in check. If you are the owner of a sweet senior cat, you probably are beginning to notice little changes occurring as part of the feline aging process. Although vision and hearing difficulties may be come as no surprise to you, claw issues might. Claw problems in senior cats are also commonplace. In elderly cats, claw thickness is one of the main issues. Senior cats' claws grow in significantly thicker than in younger cats, but the claws also tend to have an especially dry and weak texture. Senior claws are significantly easier to split and break, and they have a tendency to become overgrown. Nail retraction also becomes more and more difficult the older a cat gets. Because of all of these problematic issues, it is vital to pay close attention to the claws of cats that are around 10 years old or older. If you have a designated scratching post for your fluff ball, she may not be as interested in utilizing it as she gets older because of her weak claws. This means that your pet's claw maintenance depends on you. To prevent overgrowth problems in your cat, clip and file down her claws on a regular basis. Not only will this keep her claws sturdy and strong, but it will also make it easy for you to identify any potential paw wounds or injuries your little one may experience. 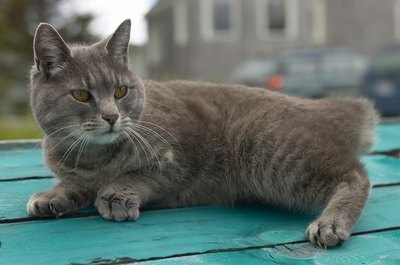 Osteoarthritis is a relatively common health ailment for kitties during their senior years. Along with joint aches, decreased activity and mobility difficulties, claw overgrowth is often a telltale sign of the condition. If overgrowth is a big problem for your cat, consider the possibility that she may have osteoarthritis -- and schedule a veterinarian appointment for her as soon as possible. If you allow your older cat's claw situation to get out of hand, you may be jeopardizing her health. If her claws are overgrown, she'll encounter pain and difficulty walking. This could trigger tearing of her claws. In some cases, tearing can bring upon infection -- definitely not something a senior cat needs. Apart from jeopardizing your precious pet's health, claw trimming neglect can be a risk for your furnishings. No one wants scratch marks all over their solid pine living room set! Do Old Dogs Need More Attention? Is It Better to Get a Young Kitten or an Older Cat? Does Hyperthyroidism in Cats Lead to Death? Do Cats Grow Their Nails Back?